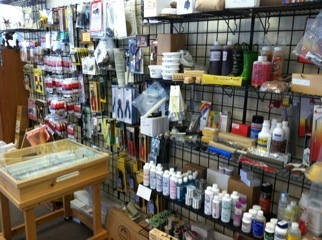 We carry a wide variety of Stained Glass, Fusing, Mosaic, Lampwork Beadmaking, and Soldered Jewelry supplies for craftspeople of all skill levels, including all of the chemicals and tools that are required to make the most beautiful artwork possible. For more information on the supplies required, stop by the store today! We also carry a selection of miscellaneous clears, mirror, dichroic, and fusing glass. 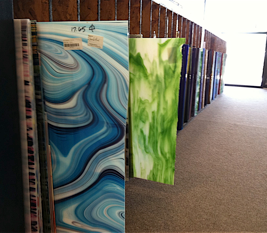 For more information on our wide variety of glass, please send us an email, call, or stop by today! 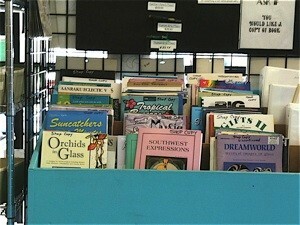 We have a large selection of books filled with amazing patterns for all skill levels. Beginners will love the 15 Pieces or Less books, and the more advanced artists will love the Aanraku books! A large quantity of individual patterns are available in our notebooks for only a minimum copy fee. Do you repair stained glass pieces? Yes we repair stained glass. I understand one of the stained glass suppliers shut down. Do you still have a good stock of stained glass.? Various colors and textures? Hello Nancy, yes we still have a very large selection of stained glass in many colors and textures. We still have most of the Spectrum line in stock at this time but that factory has closed. Going forward we will be offering more Kokomo, Wissmach and Armstrong varieties to replace the Spectrum as we run out. No worries we can still get glass from many sources! 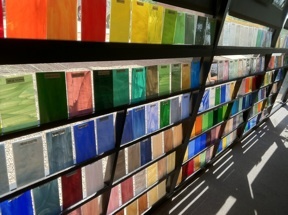 You will need to call the store at 480-655-2000 and tell us what glass you need in order to get a price. Do you sell scalloped copper foil? Sorry for the delay, yes we sell scalloped foil. I am looking for a hummingbird beveled glass kit. Do you have such an item about 8 inch? If so, approximate price. We are trying to find a source for those bevel kits and we will let you know if we find them. my husband has done stained glass work and he is very good. we plan to move to the phx.area and I am trying to find studio space for him to work. we would like to locate in possibly west side of town. that is not for sure yet. he needs to find even a space he can share with an artist of another medium. I am hopeful someone may have some ideas. Hello we do classes four different times per week for three hours per session. Your husband can sign up for one or more classes at $60 per month per class. Need to replace sixteen 10-1/2 x 11 pieces of glass for four outside post lights pillars . Would like clear or something with slight (raindrop) pattern. Are you open on Tuesday /19 and do I need an appointment? Yes we are open on Tuesdays and no you do not need an appointment.